Please visit my Facebook page to see <================ latest pictures! Because, as mentioned earlier, you will have to give it a chance, try to look differently. You may have to learn to see beyond the veil. There's definitely more than meets the eye at first glance. Most people smile compassionately when being told that someone has seen something like, let's say a ufo, a ghost or.... a nature being. We, as a species, have been so self obsessed over the last centuries (if not longer), we seem to have lost contact with nature. Lost contact with the living planet we dwell on. I'm convinced that the subtle world is constantly communicating with us. "On demand" or spontaneously. Many realms may be able to open their communication ports. We may ask those who went before us to speak to us and get answers if we look or listen carefully enough. Or even with the aid of modern technical devices. And also Mother Nature is trying to find a way to communicate with us. By inspiring us and also by unveiling her unseen layers we, as humans, may have forgotten about. I'm a ITC (Instrumental Trans Communication) researcher. ITC stands for trying to make contact with the dead by means of modern technology. But there seems to be a much broader spectrum of worlds we can make contact with. 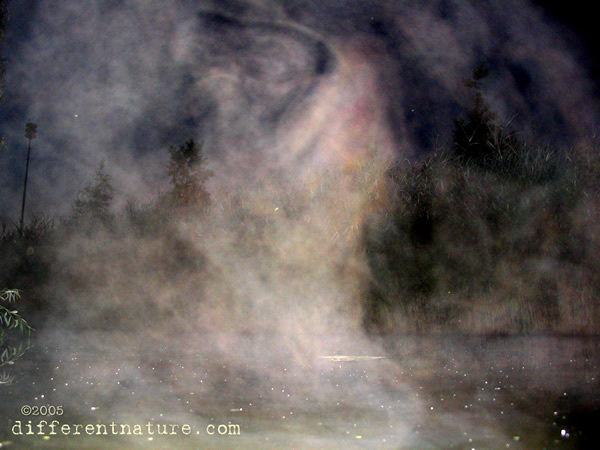 Like the realm of nature beings, or nature spirits. I think of myself as rather down to earth. I do not have exceptional paranormal abilities. I'm open to every possible explanation. I don't exclude anything just like that. This has taken me on a, still ongoing, adventurous journey. Nature as seen through our every day eyes is already beautiful. This website aims to show that everyone with an open mind, everyone who takes the time and is willing to listen or look carefully and differently, will eventually become aware of her spirit and will be able to reconnect to her. Nature is also in the centre of most, or maybe all ITC contacts. We need the elements to create ITC. Nature can (re)connect us with the past, the future, our deceased loved ones and so on. Our advanced devices merely record it. The pictures on this website are examples of this diversity. 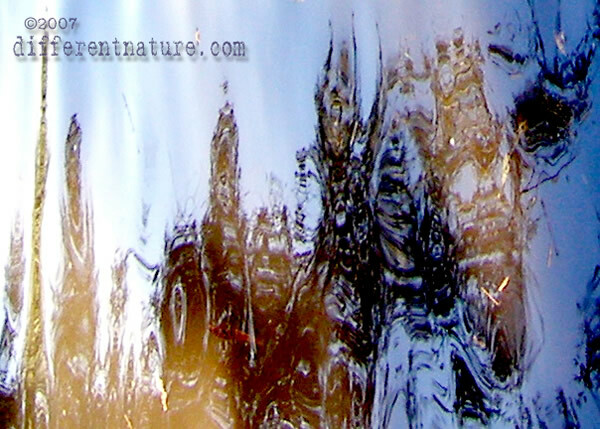 Summer 2010: Nature as a projection screen. 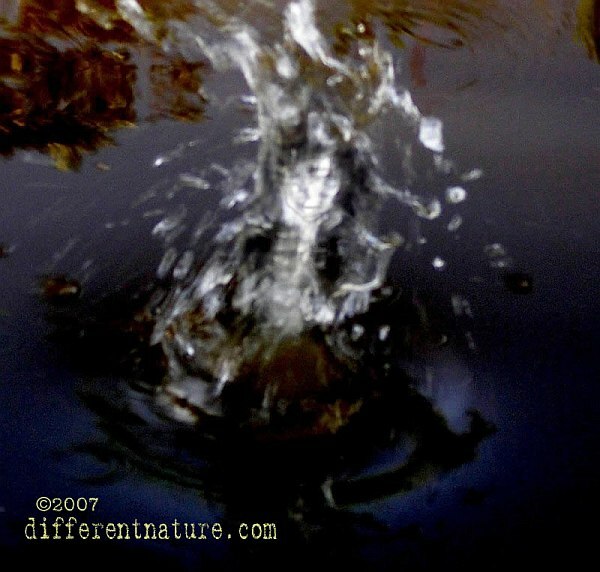 This strange image appeared in the water, before my camera eye. Of course it is a bit distorted, although one can recognize two distinct persons. Not quite sure what this picture represents though. 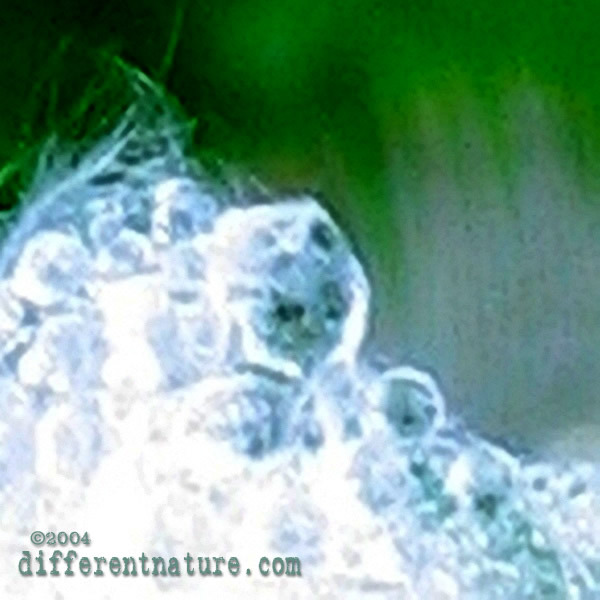 Images from tap water ! 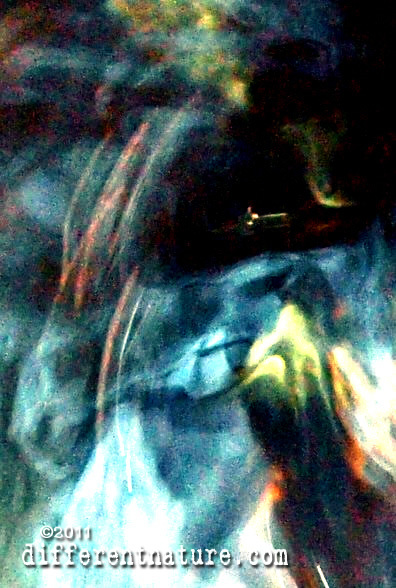 This is an picture crop from an early 2011 experiment, showing clear images (mainly animals e.g. 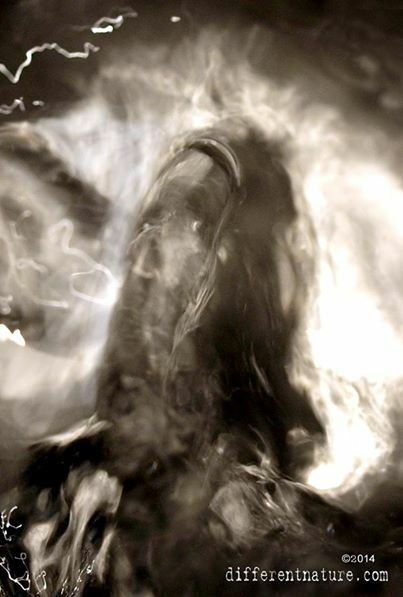 a horse's head) in plain water from the tap. 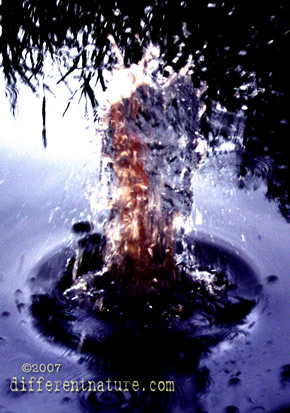 This could be an example of the alleged memory water is said to have. 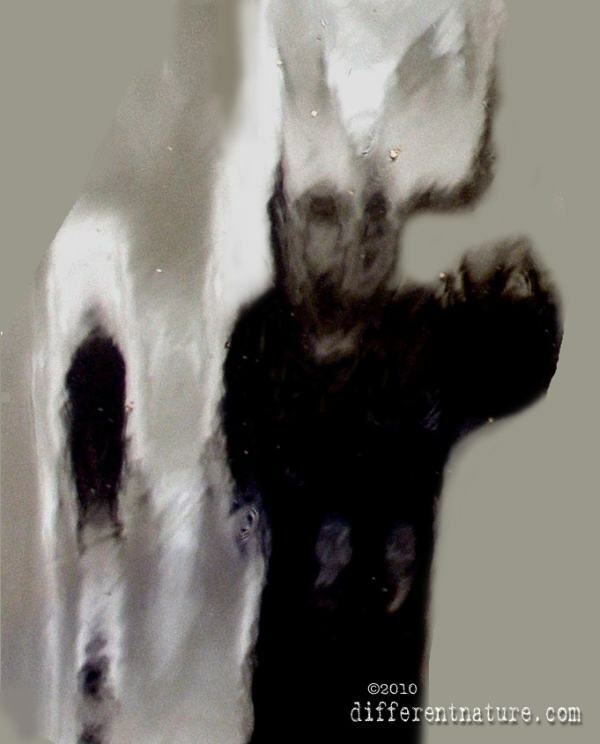 Or is it a projection, deriving from morphogenetic fields or spirit beings? Well, anyhow, interesting it is! Autumn 2008. Look amidst the mushroom stems. Looks like a little man. Some people asked me:"Well, you've Photoshopped this one, didn't you?" Well, no, I didn't. 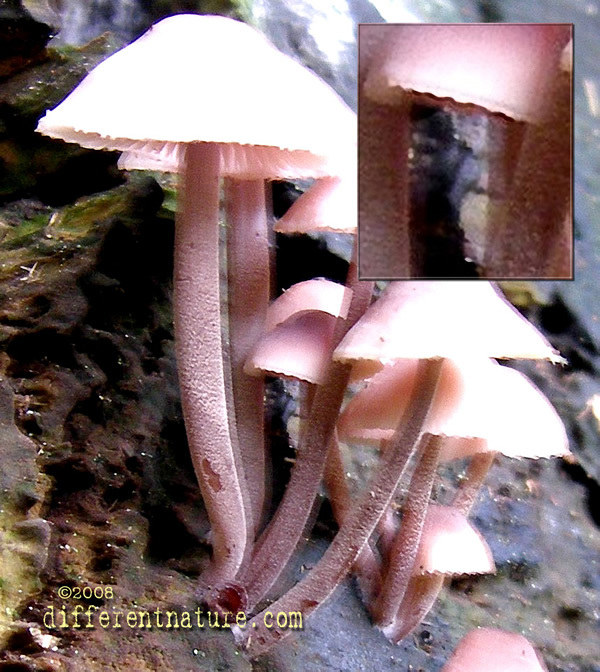 I've noticed strange phenomena activity near mushrooms more than once, as weird as it may sound. 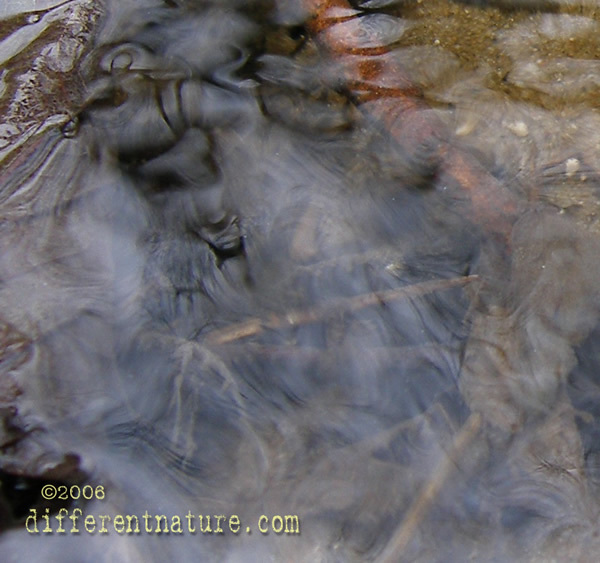 The last couple of years water has been playing a key role in my research more and more. Not strange if you look at the altering views on the nature of water in the last decade. The research of dr. Masaru Emoto has provided us valuable insight. The image on the left is an example. It is a reflection of myself, my shadow in the water. And it's seemingly transformed by the wrinkles in the water and the angle of the incoming sunlight. And it's seems that there's intelligent design behind it. Something wanted this image to be projected and was able to do so by controlling the circumstances for the split second the picture was taken. According to several people it looks like an "indian with a bird". Over the last few years I have found many images that seem tot refer to native Indians. It then struck me that this is nature's (or the old Indians') way to tell us that everything is out of balance. We are overconsuming and exhausting the natural resources in, what ?, a couple of hundred years, leaving the world uninhabitable eventually if we go on like this. The Indians may well have been one of the last communities that lived in harmony with nature and just took what they needed to survive and showed respect for their surroundings. Much more than we do now, anyway. Another water reflection. This looks like an "old indian" shining through. Look at his face. Kind but inquisitive. Wouldn't you say he's waiting for our recognition? Below: "Splashing" Indian. 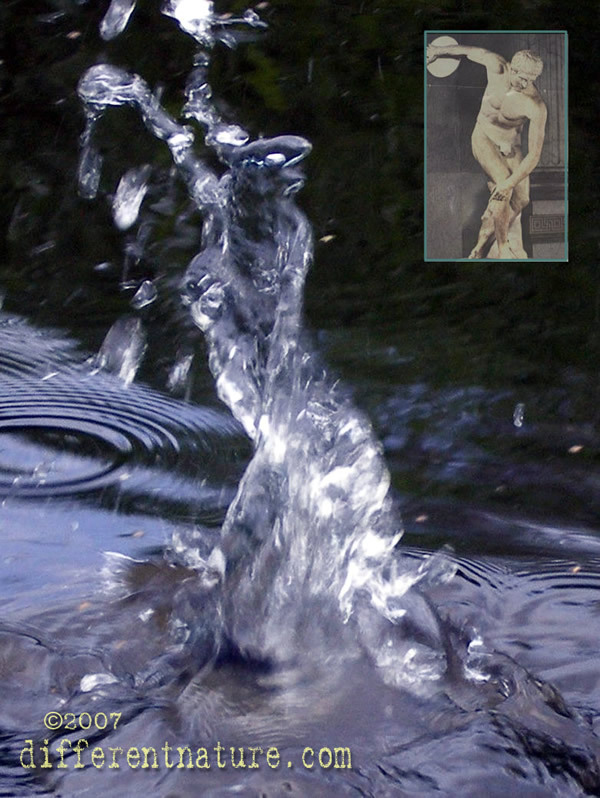 Note the details, like hand and arm, composed of water drops in motion. Picture above: A few years ago I took the picture below. 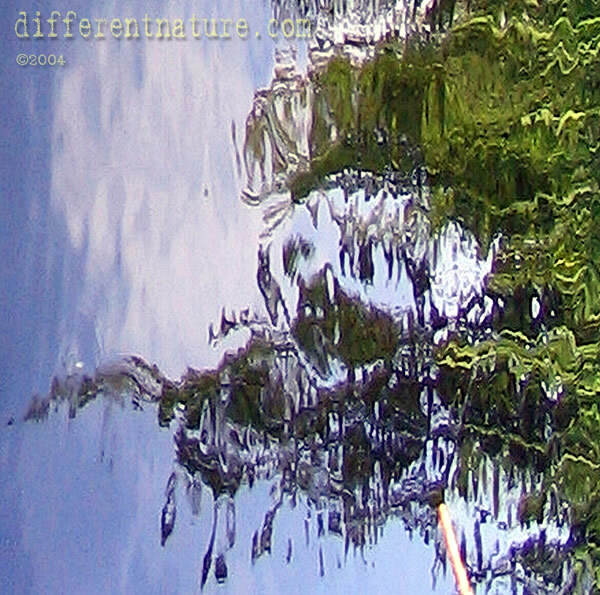 I took it in a small stream, or rather a ditch, bordering a small forest near our holiday home in The Netherlands. 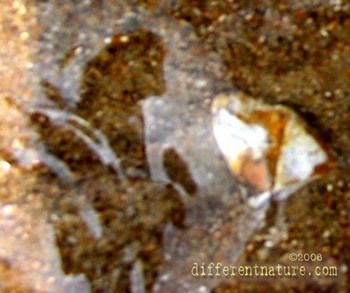 A being evidently appears in the water and people I showed it to, often recognized some sort of beast (like the one in "The beauty and the beast") or sometimes a lion. Some years later we "met again". Read more. The pictures on this website were not modified in any other way than enlarging, cropping or occasional contrast/level/colour adjustments to enhance the visibility of the objects to make them stand out more. When I was in Scotland August 2008 I couldn't help myself. I had to take some pictures of Loch Ness. And see if something extraordinary would happen. 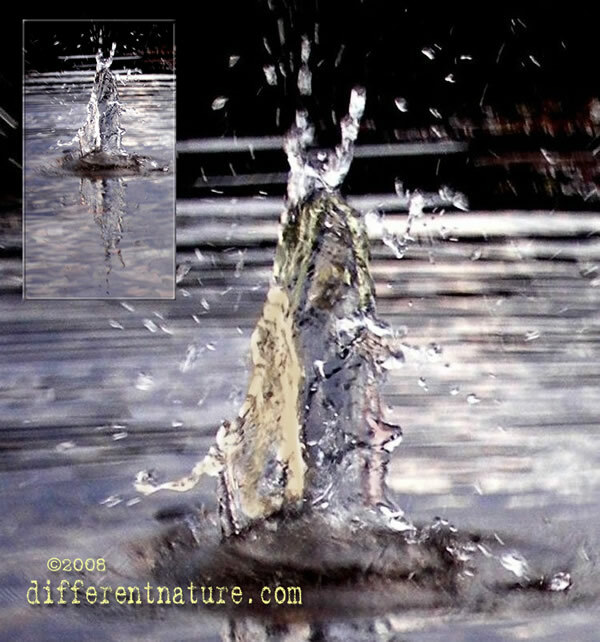 I decided to experiment with my "plunge" technique, which implies I throw stones into the water whilst trying to establish a mental contact with the connected energies at the same time. 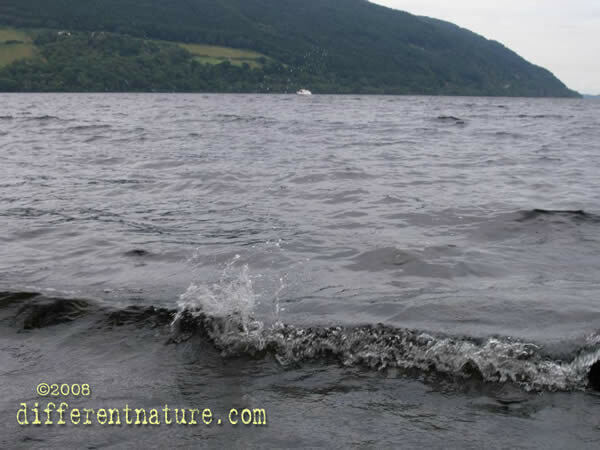 The picture below was taken near Urquhart Castle and definitely shows something that looks like a ferocious looking monster emerging from the water. Reactions from people I showed it to vary from a T-rex, a dragon to a mad dog. But without exeption I found it to be associated with a dangerous animal. Of course this is not your flesh and blood Nessie, but could it be an indication that there really is something down there? Or "just" a materialization / visualization of the myth? The keeper of the Lake...? The picture below was taken at Loch Eil, Scotland, August 2008. Pagan goddess appearing in Abu Simbol temple? Intriguing holiday picture. This photo was taken by Francis. I know her from work. To me she's a trustworthy person with an open mind. She brought it home from her holiday in Egypt in September 2009. Most people instinctively say: "it's a bird". But have a closer look and then read Francis' story. And then read some more background information below. It might put it into another perspective for you. It did for me anyway. 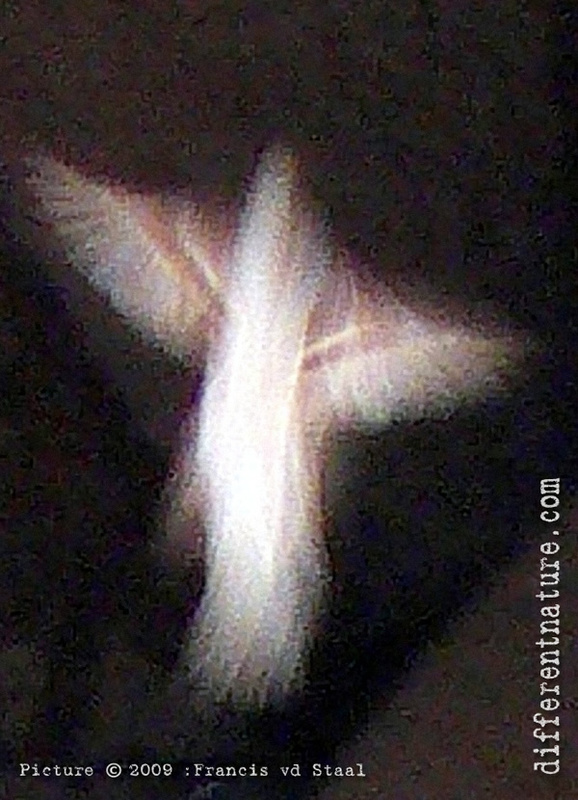 Francis: "I took this picture inside the Abu Simbol temple (Egypt). It is the second of two pictures I took in the grand hall. When I had taken the first one, I saw a white haze on the picture. I suspected it was something on the lens, so I cleaned it. After about 20 seconds I took this one. When I examined the pictures later I discovered something on the second picture. At first glance and from a distance, it looks like a bird. But I was sure there were no birds inside the temple. Neither had I spotted them outside. 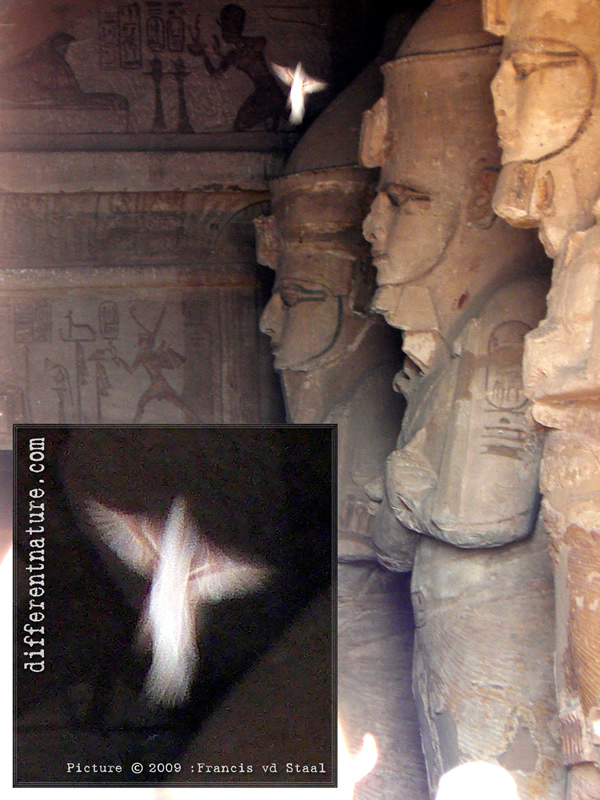 Intuitively I knew I had photographed an energy that had taken the form of an angel..."
A friend of mine studied Egyptology. He told me that the picture reminded him of the Egyptian goddess Maat. Maat is the Egyptian goddess of truth and justice, the daughter of Ra, the sun god. After the universe was created, it was Maat who brought harmony amidst the chaos and disorder. Maat was a concept as well as an individual. As a concept she was in law and justice and pharao's were often depicted with an emblem of Maat to emphasise their role in upholding the laws of the Creator. Maat as a goddess weighed the souls of the departed in the underworld with her feather of justice to determine whether they could reach heaven and the afterlife. Maat was the only Egyptian god in human shape that was often depicted with wings. It is thought that she served as an example for the first Medieval images of the well-known angel. Maat was honored all throughout Egypt. Maat was often depicted holding an ankh, the symbol for eternal life. 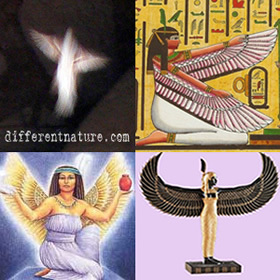 One cannot deny there are ressemblances with old depictions of the goddess Maat, like the ones above. We analyzed the EXIF data of the picture and concluded the flash didn't go off. This makes it less likely an overexposed insect was captured and misinterpreted. How to attract our attention? 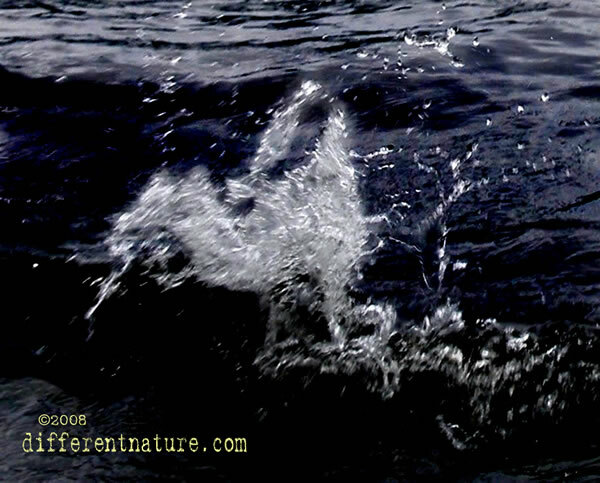 Nature's spirit seems to be crying out for us, desperately seeking for a language we understand. 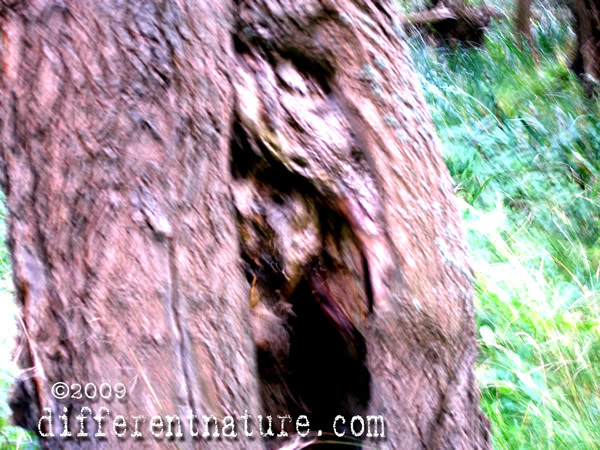 Could that be the reason we are presented more or less recognizable human-like shapes, like in this tree? Picture below: picture of a fungus growing on a tree. 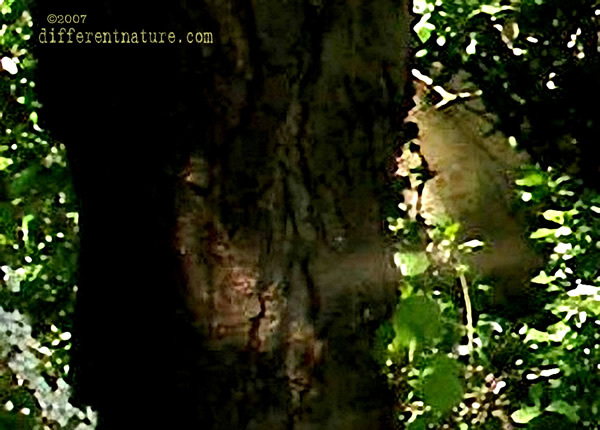 Left is the original, in the middle I enhanced part of it, so the head of an "apeman" can be seen clearly and on the right you should be able to see a gnome's head. It's so beautiful to see how these images collaborate with each other, are connected with each other and are part of one another. One cannot exist without the other. That is the essence of nature isn't it? Is that what it wants to tell us? That we have to become aware of this? 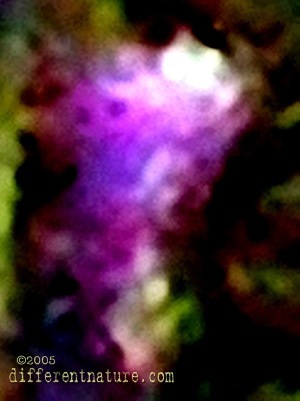 Picture below: beautiful manifestation of what seem to be faery-like beings on a flower. 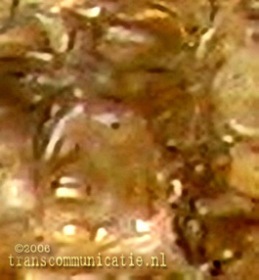 The picture below is full of beings, faces, objects, even animals, often shown in a primitive way. Images from a collective memory ? 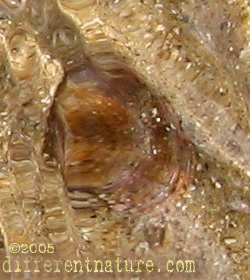 Click here or on the picture to see the original picture plus several larger cropped details (opens in new window). If this doesn't come close to how we usually think of fairies, I don't know what does. 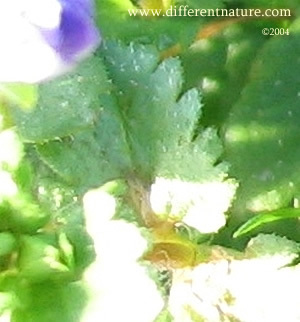 It must have measured about two centimetres and was apparently hovering above flowers. Or was part of them, for that matter. Picture was taken in the evening light. Note: I enhanced colors and some features to make them stand out more, the figure can be seen clearly on the original photo though. The Latin phrase "Naturam si sequemur ducem, numquam aberrabimus" (Cicero) means: "If we take nature for our guide, we shall never go astray". I think there might be some truth in there.